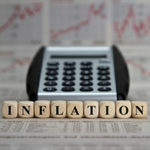 Despite excellent economic growth, rising wages, and the lowest unemployment rate in 49 years, inflation remains quiescent. The Fed’s preferred inflation measure, core personal-consumption expenditure inflation, rose just 1.8% over the past year, and has been around that level, close to the Fed’s 2% inflation target, since February! A strengthening dollar, low inflation expectations, weak commodity prices, and slowing global growth are helping keep inflation in check. Hopefully, this continues.